How do you spot a robot mimicking a human? How do you recognize and then deactivate a rebel servant robot? How do you escape a murderous "smart" house, or evade a swarm of marauding robotic flies? In this dryly hilarious survival guide, roboticist Daniel H. Wilson teaches worried humans the keys to quashing a robot mutiny. From treating laser wounds to fooling face and speech recognition, besting robot logic to engaging in hand-to-pincer combat, How to Survive a Robot Uprising covers every possible doomsday scenario facing the newest endangered species: humans. And with its thorough overview of current robot prototypes-including giant walkers, insect, gecko, and snake robots-How to Survive a Robot Uprising is also a witty yet legitimate introduction to contemporary robotics. Full of charming illustrations, and referencing some of the most famous robots in pop-culture, How to Survive a Robot Uprising is a one-of-a-kind book that is sure to be a hit with all ages. 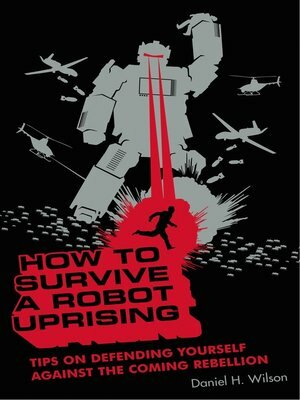 How to Survive a Robot Uprising was named as an ALA Quick Pick for Reluctant Readers. Daniel H. Wilson is a Ph.D. candidate at the Robotics Institute of Carnegie Mellon University, where he has received master's degrees in Robotics and Data Mining. He has worked in top research laboratories, including Microsoft Research, the Palo Alto Research Center (PARC), and Intel Research Seattle. Daniel currently lives with several unsuspecting roommates in a fully wired smart house in Pittsburgh, Pennsylvania. This is his first book. Click here to listen to an audio sample and to purchase the audiobook version of the title.